Fidel Andy was born in 1966 on the river island La Soga in the outskirts of Tena, Ecuador, where he still lives and practices. He began his training with both his grandfathers at the age of six, learning about healing energies and medicinal plants. Soon he was introduced to tobacco infusions, taken first through his nostrils and later orally. He has spent substantial time in the forest finding his element, water, observed a variety of diets and practised celibacy until his mid-thirties. At the age of sixteen Fidel began to cure his immediate family, by the age of nineteen he became sought after by other people as well. Fidel is acquainted with San Pedro and Angel’s Trumpet, but Ayahuasca, which he began to drink at the age of 14 is his main companion plant alongside tobacco. 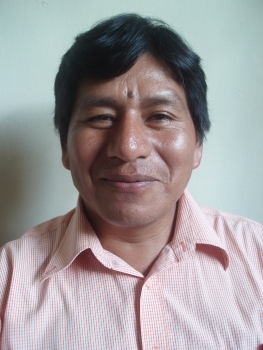 As a widely recognised curandero, Fidel is often called upon by communities around Ecuador to heal, and resolve conflicts, and he continues to learn from a variety of ethnicities and teachers: “We never stop learning”. One of the initiatives within the constituent assembly processes spearheaded by ASHIN concerns further entrenchment of traditional healers in the Ecuador. A proposal to employ healers in conventional hospitals and to explore the possibilities for awarding academic credentials to traditionally trained healers was recently adopted by the “III Congreso Nacional por la Salud y la Vida”, which issued a “Declaración de Cuenca” in support of ASHIN’s demands and many other health related reforms. Alongside all of these activities, Fidel is conceptualising a set of academic workshops for medical doctors, psychologists, para-psychologists, hospital directors, pharmacologists, and constitutional lawyers about medicinal plants and their traditional usages; as well as working with independent researchers of a reforestation and autonomous development foundation to develop a “Casa de la Salud” offering traditional healing in Tena. Finally, Fidel Andy’s door is always open for people from near and far who want to learn about Ayahuasca and reflect on personal and relationship development, creative unfolding and, of course, for healing of whatever illnesses -mental, physical, or social-, that anyone may approach him with. However, his main commitment continues to be his work with local communities and individuals. Constitutional Politics in Ecuador: Correa and Gutierrez vs. the People. It was a pleasure to meet Fidel Andy at the 3rd Amazonian Shamanism Conference held here in Iquitos, Peru last July. And now that I know that he is confirmed to be at the 4th Conference, July 19th – 27th, 2008. We’re very happy that he has decided to come back and I hope many people get the opportunity to speak with him and be in Ceremony with him during and after the Conference. I know I will be there. The journey you are speaking of, coming down the Napo River to get to Iquitos is truly an amazing one. I’ve done this twice, staying with the indigenous along the way. They are very hospitable and literally go out of their way to make sure you are comfortable. The photographs I got of rainstorms and especially sunsets are the finest in my collection. This is an incredible journey, I hope many will come with you!